Al Kawthar is a UK-based online store selling abayas, hijabs and accessories, which launched in 2010. 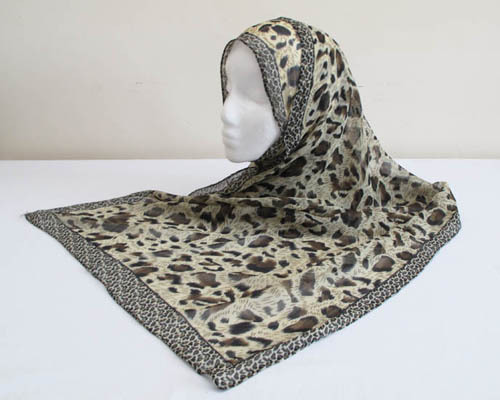 They recently sent me the Leopard Print hijab in brown to review. The package arrived swiftly, within 2 days, and I was assured this was the usual shipping time for customers. The hijab itself measures 160cm x 55cm, and is made from a very lightweight polyester chiffon. The print is beautiful, the colours well-defined and I personally love the contrast between the main print and the smaller border. The colours in the photo on the website (above) are also true to real life. This scarf is very thin and so quite see-through at one layer thick, although once wrapped around and worn with an undercap, isn't too much of a problem. Also considering that the scarf is not very wide either, this doesn't provide much flexibility in terms of styling. However, if you prefer smaller, neater scarves for practical reasons, then this might be right up your street. The fabric is also slightly textured, meaning it won't slip around. It is quite delicate and care needs to be taken if using pins. I found that this scarf looks best worn with darker colours like brown and black. I love the print of this scarf and the lightweight fabric, although a little larger size would make it ideal. At a bargain sale price of £4.80, it's great value and looks a lot more expensive than it really is. Jazhakhallah khair for the Al Kawthar review. It made me look at their website + I just made my first purchases from them yesterday - lovely variety of scarves, very reasonable prices and most of all, the customer service and assistance was excellent. There was an error with my shipping costs and Al Kawthar were prompt in notifying me and gave me the option of canceling the order or paying in the additional shipping costs due. They were incredibly apologetic about the error but efficient in sorting out my order - which I did not cancel and in fact added on another scarf. I was pleased to receive an email today that my items have been shipped + that I am able to track my order.